A comprehensive halachic guide: The Seventeenth of Tammuz, The Three Weeks, The Nine days, Tisha B’Av, Tzom Gedaliah, Asarah B’Teves. For tens of thousands of readers, Rabbi Simcha Bunim Cohen’s books of halachah, Jewish law, are synonymous with extraordinary clarity. Rabbi Cohen has the rare gift of being able to take complex topics and make them understandable without talking down to the reader. Even more remarkably, he can, in the same volume, steer the layman through the maze of halachah while enriching the scholar’s understanding of the background issues and halachic sources, logic, and debates. 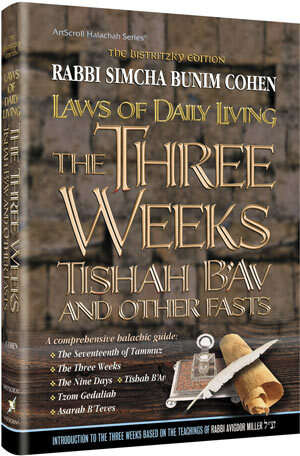 In The Laws of Daily Living: The Three Weeks, Tisha B’Av, and Other Fasts Rabbi Cohen examines one of the most important – and surely the saddest – times of the Jewish year, when the Jewish People mourn the loss of the Temple and the Exile that followed. In his clear and authoritative manner he examines the laws of all the fast days (with the exception of Yom Kippur), the restrictions of the Three Weeks, the heightened sense of loss that builds up as we approach the Nine Days, and the climactic mourning of the Tishah B’Av fast. The book is enriched and deepened by a discussion of the historical background of the momentous events that led to the Temple’s destruction, based on the teachings of the author’s grandfather, the renowned Rabbi Avigdor Miller zt’l. This adds a new and important dimension to the way we mark this period. With the best of intentions, it is not easy to mourn something that we never knew and hardly understand. Rabbi Miller’s thought provides a moving and profound discussion of the Beis HaMikdash, its role in our lives, and the all-consuming loss that the Jewish People suffered with its destruction. Those who truly mourn the loss of the Temple, say our Sages, are destined to rejoice in its rebuilding. As we study and learn to properly follow the laws of these sad weeks, we bring that long-awaited moment ever closer.